it snowed today, first snow of the winter, MY nose is killing my head, am not liking it. i really liked this pic, so much effect and all, feel like doing just that but well, i dont see that happening. DUST ALLERGIES??? Some ppl don't know when they have the good things in life... Try coming to Bangalore... You'll know the true meaning of dust allergy... Hmph. so whoz pic is that? 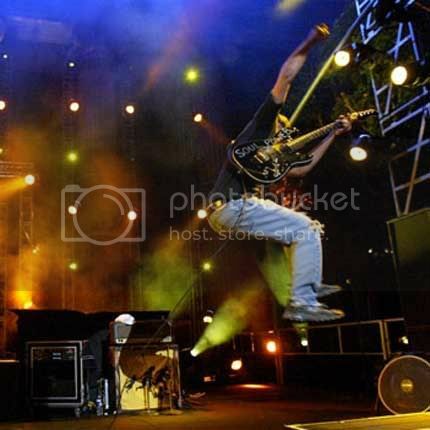 heheh, its more like i wish he was my boyfrnd, the guy in the pic is Tom Morello. First time on your blog, like your style, but worried that you are always angry, why? What makes you happy, smile? Saw them play with U2 in Hawaii last year. They did an incredible version of Hawaii78 which i can't find anywhere, but i have heard it on the radio.